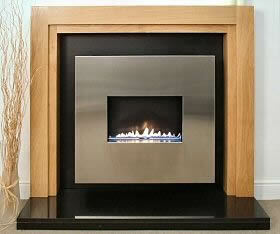 We have a range of over 40 gas burners and 40 different surrounds. This gives us over 1000 variations of traditional fireplace. With so many options available it is difficult to display the full range on the website. We have our designer showroom in the North of the UK with traditional fireplaces on display. In the showroom we can discuss your full requirements and you can review the complete brochure of available surrounds and finishes. Shown below are some of our most popular traditional fireplace designs. 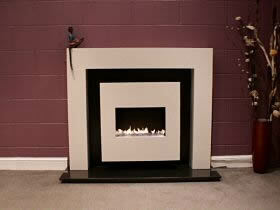 We believe in creating gas fireplaces which are beautiful and made to a high quality standard. We have a new A4 brochure with all of our surround and hearth options – call for latest brochure. NEW: This new glass fronted inset gas fire features a modern 2.7kw gas burner with fireplace logs. A traditional log burning fire with the added benefit of energy efficiency and the low running costs of gas. 2.7kw heat input and only 12p/hour running costs. Using our fire ribbon burner gas technology we can create a stunning open gas fireplace using a wide range of traditional fire surrounds. Shown left: This gas fire was designed as a custom fireplace for a client. The surround is carved from Italian Marble and the gas fire uses our 860mm wide 12kW gas ribbon burner with dancing flame. There are 4 sizes of ribbon gas fire burner to choose : 520mm, 850mm, 1200mm and 1500mm. 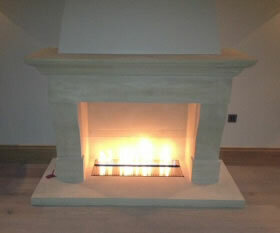 Shown left: Fire surround in Limestone with CVO 14kw 850 Ribbon Fire Burner Box. This was a custom design for a client who wanted a contemporary gas fire burner without logs but with a traditional twist. We can incorporate our gas burner designs into a wide range of surrounds, call to ask about this very unique and special design. The Anubis suite is manufactured to a very high standard and is complemented by a carved stone surround. Carved Stone Surround and Hearth in Black Granite. 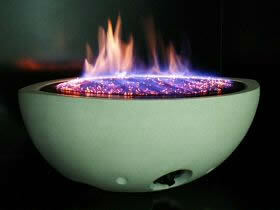 Fire bowl available for Natural Gas or LPG. Enclosure in Satin Black Steel with optional gather. A wide range of other gas fires are available to suit. Other surrounds available upon request. This ICONIC design was created in 1999 and started the trend which has seen a number of “imitations” created. Winner of the Price of Wales Design Award the Gas Fire Bowl features gas burner technology which creates a sparkling undulating sea of blue incandescence to gentle peaks of yellow flames. 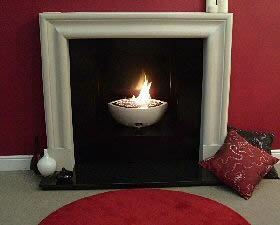 There are three styles of gas fire bowl – small oval fire bowl , large oval fire bowl and circular fire bowl . For homes that do not have a chimney we have a range of flueless gas fires which can be supplied within a traditional fireplace surround. The gas fire will suit any style of surround. If you do not like our standard surrounds please supply drawings of the surround you require and we can design this to suit our flueless gas fire technology. Our unique gas burner technology allows us to make a CE approved flueless gas fire without a glass front. Ultra clean burning with a beautiful, dancing flame. 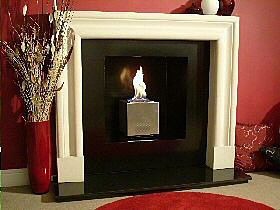 This traditional flueless fireplace has a cream stone fascia and surround. Beautiful Cream Surround and Fascia. 100% Energy Efficient – Running Costs from 7p/Hour. Choose from Natural Gas 2.7Kw or 3.5Kw, LPG 3.5Kw. Choose from Manual or Remote Control. A beautiful traditional style flueless gas fire with a solid wood surround, open flame gas fire technology , black granite hearth and cream fireplace fascia. Beautiful Wood Surround and Cream stone fascia. 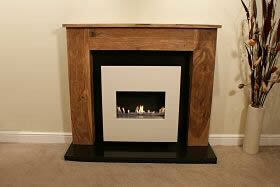 The beautiful Solid Oak or Walnut surround (not veneer) complements the open flamed flueless gas fire. The gas burner is available with wide choice of options. 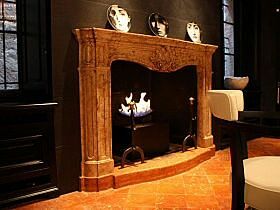 The Corona is supplied as a complete flueless fireplace package. Choice of Oak or Walnut. Choice of Stainless or Black Fascia. Other Gas Fire Options to Consider. We have 30 CE approved gas burners available and there are multiple design options available. See below for examples. The cast slit is a truly unique gas burner design by CVO fire. the burner is shaped in a unique floating blade and uses ceramat burner technology to create the impression of a floating flame. There are many installation options available with this fireplace. Shown left installed in Italian Villa. 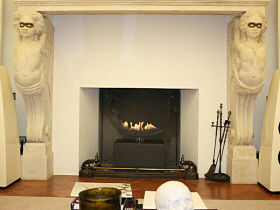 Another example of the cast slit gas fire installed within a traditional surround. Shown left installed in Customer Home. The Geometrix cube gas fire is available in a very wide range of finishes and can be operated by manual or remote control. We have a full range of Traditional Fireplace Surrounds available to supply with any of our gas burners. The images below show examples of the styles available in the range. 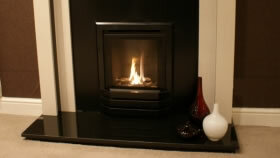 We can we supply the Fireplace Mantel (or Surround), the Hearth, the Backing Plate and the Gas Fire, everything you need. View our Fireplace Surround brochure in PDF format. Spirit Fires Ltd was established in 2007 and sells the CVO, Spirit and EasyFire brands. We sell our unique fireplace designs direct to the public via our own telesales department on 01325-301020 and from our FIREVAULT showroom at Newton Aycliffe – County Durham. In our showroom you will find a large selection of gas and bio-ethanol fires on live display. As we only sell and manufacture our own brand of fireplaces you will be given impartial advice as to the best style of fire to suit your budget and requirements. Call our Sales team on 01325-301020 during office hours to buy direct. 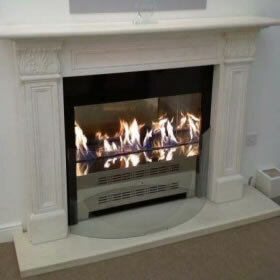 Visit our Fireplace Showroom based in the North East.